Combining perspectives from virology, molecular pathology, and social and cultural history, Going Viral: The Mother of All Pandemics is an eight-part podcast series dedicated to the 1918-19 Spanish influenza pandemic. Recorded in London, and on location in Washington DC and northern France, the series is presented by medical historians Mark Honigsbaum and Hannah Mawdsley and produced by Melissa Fitzgerald of Zinc Media. Available from iTunes, Libsyn and other podcast providers, Going Viral has been downloaded more than 16,000 times since its launch in the summer of 2018. The podcast series aims to engage general listeners in the history and science of the biggest pandemic of modern times, the 1918-19 ‘Spanish influenza’. Inspired by the true crime podcast Serial, it explores different scientific theories as to the pandemic’s origins (despite its moniker, the pandemic almost certainly did not begin in Spain) and transports listeners to the scene of one of the greatest ‘viral crimes’ in history. In the process, we ask why the Spanish flu proved so virulent (the pandemic is estimated to have killed 50 million to 100m people worldwide) and why the majority of its victims were young adults. In the process, we visit the laboratory in Bethesda, Maryland, where in 2005 scientists recovered the virus from stored pathology specimens, and travel to a former British military camp on a migratory bird flyway close to the Somme estuary, where some experts believe the virus may have jumped from birds to people as early as 1917. We also talk to cultural historians about why the Spanish flu left so few traces in public memory, discuss artworks inspired by the pandemic, and consider the risks of a similarly devastating outbreak occurring again – and what we can do to prevent it. Conceived by Dr Mark Honigsbaum, a medical and cultural historian based at City University of London, the podcast took six months to produce and edit. Teaming up with Melissa Fitzgerald, an experienced BBC radio documentary producer, and Hannah Mawdsley, a PhD student with access to an archive of letters from more than 1,000 survivors of Spanish flu, the team began by securing the cooperation of leading scientific experts, including the British virologists John Oxford and Wendy Barclay. 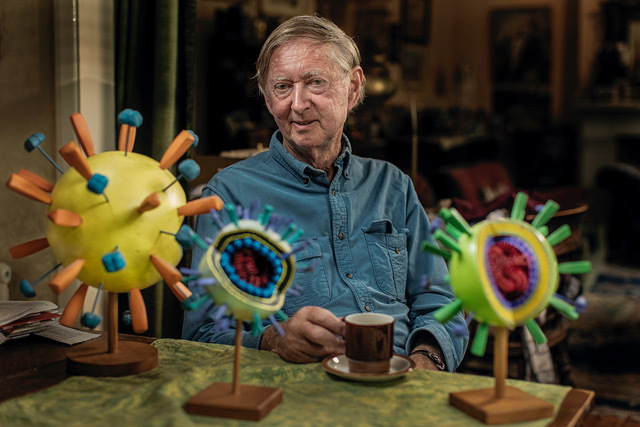 Thanks to £30,000 in funding from the Wellcome Trust, we were able to travel to Etaples in northern France to explore Professor Oxford’s theory that a former British military camp may have been ground zero for the pandemic virus. In addition, we visit the National Institutes of Health in Bethesda, Maryland, to interview molecular pathologist Jeffrey Taubenberger and tour the secure biohazard facility where he keeps the resurrected pandemic virus on ice. Prior to broadcast we forged partnerships with the Royal College of Nursing and the Florence Nightingale Museum, both of whom mounted exhibitions on the Spanish flu in 2018-19, and with the Shobana Jeyasingh dance company, whose dance, Contagion, was similarly timed for the 100th anniversary of the pandemic. Our ambition was to engage audiences who may have never heard of the Spanish flu and knew nothing about its history or the on-going scientific questions about its mysterious origins. 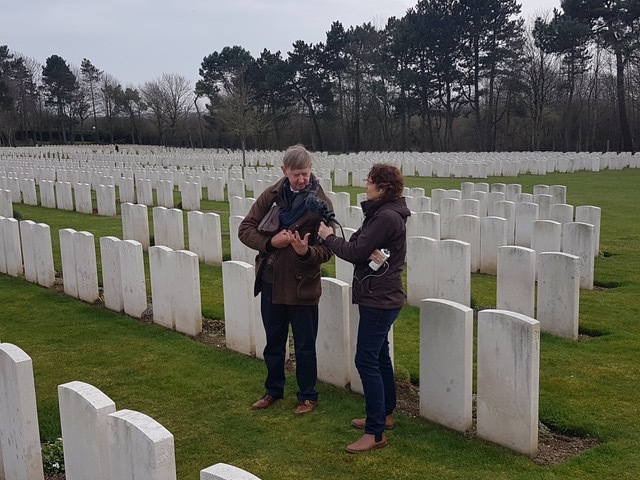 Through interviews with cultural and social historians and visits to cemeteries in northern France and elsewhere, we also aimed to initiate interdisciplinary discussions about the emotional residues of the pandemic and the processes of memory and forgetting. We knew the podcast would find a receptive audience among doctors, nurses and other health professionals. What we did not expect is that the podcast would also be positively received by educators, particularly in Canada where the series was adopted by ‘Defining Moments Canada’, a bilingual commemoration project that aims to engage secondary school students with the history of the pandemic (our podcast is the process of being incorporated into lesson plans all over Canada). To judge by the comments on Instagram, Twitter and iTunes, the podcast reached listeners who would not ordinarily be interested in science and health subjects, much less the history of pandemics. Podcasts involve a lot more work than you might think – pick your interviewees carefully, then edit, edit, edit. Don’t preach or talk down to your audience - podcasts are about making listeners feel they are part of the conversation. Forge partnerships with sympathetic organisations and institutions and ask them to re-tweet your episodes to their followers- it’s no use making a podcast if no one engages with it. Presented by Dr Mark Honigsbaum @honigsbaum and Hannah Mawdsley @HannahMawdsley. http://goingviralthepod.libsyn.com/ - also available from other podcast providers.